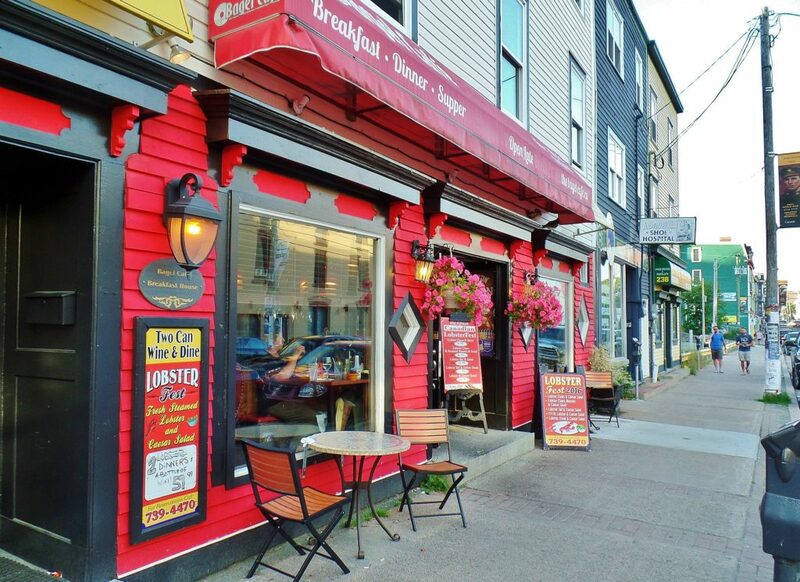 Walking into Bagel Café on Duckworth Street is like walking into the den of an eccentric pack rat. Harry Potter fans might liken it to The Room of Requirement in Hogwarts Castle. Some would think of a curiosity shop or bric-à-brac store. A gardening type might make an analogy with a secret garden, compact and compartmentalized, hopped up on fertilizer and overgrown with an abundance of strange, disparate plants. Others might think someone had raided the sales tables at Winners and gone to town hanging, sticking and plunking stuff down with abandon, wherever his or her heart desired. One thing is certain, if you suffer from claustrophobia, you might want to sit outdoors at one of Bagel Café’s sidewalk tables. (We remained inside because the place was nicely air conditioned.) Inside, where almost every table seems to be hidden behind a barricade and where walls are festooned with mirrors, coloured plates, posters, black and white photos, metal wall art and other acquisitions, it’s very easy to feel like the room is closing in on you. And what about all those artificial plants and a ceiling fan that looks weirdly like a Cuisinart attachment, or possibly something that doubles as a drone? I had the uneasy feeling that it might disengage from its bay at any second to go on a mission. Three different servers took care of our table. First was a young woman who came for the drinks order. I saw a sign that read “Kickin Claw Caesar”. Not having had time to read the description I asked her to describe the drink for me. She went silent. I felt a little bad for asking because it appeared my question had taken away her power of speech. 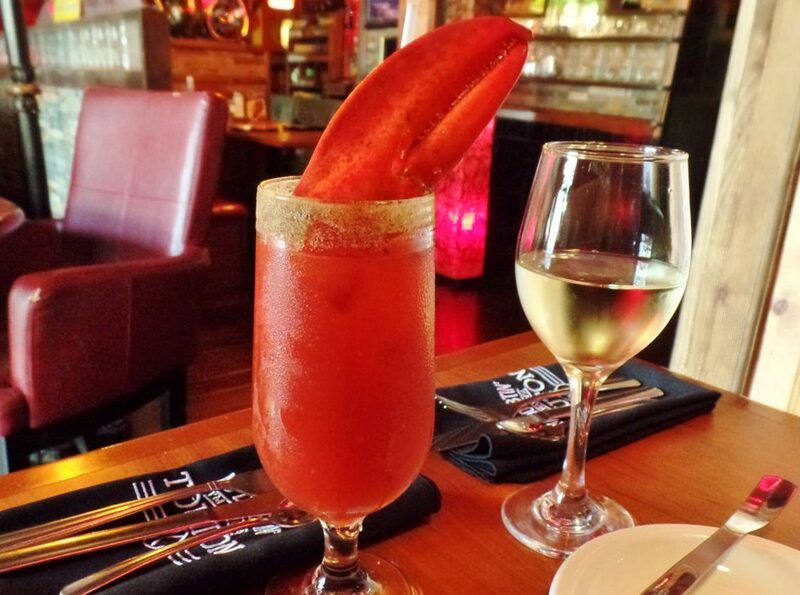 Finally, she relaxed and nodded when I said, “I guess it’s a Caesar with maybe a lobster claw in it?” (Lobster is a house specialty.) I continued, “And the lobster claw shell hasn’t been cracked?” She nodded again and managed to get out a relieved, “You have to crack it.” Guilt made me order one. It cost ten bucks. If I were served a cocktail in a goblet with a lobster claw (freshly torn from the crustacean) sticking out of it at Raymonds, I would be taken aback. But, in the unbridled surroundings of Bagel Café, the pick-me-up with pincer looked as in place or normal as a glass of tap water from Windsor Lake. I made a mess cracking the claw with the lobster cracker and pick provided but it was worth it. The lobster meat reminded me of how splendid seafood can be when it’s properly cooked. Washing it down with a Caesar kicked up by Tabasco and vaguely flavoured with lobster juice seemed perfectly appropriate and a good way to begin the meal. Mussels should taste of the briny but not of brine. 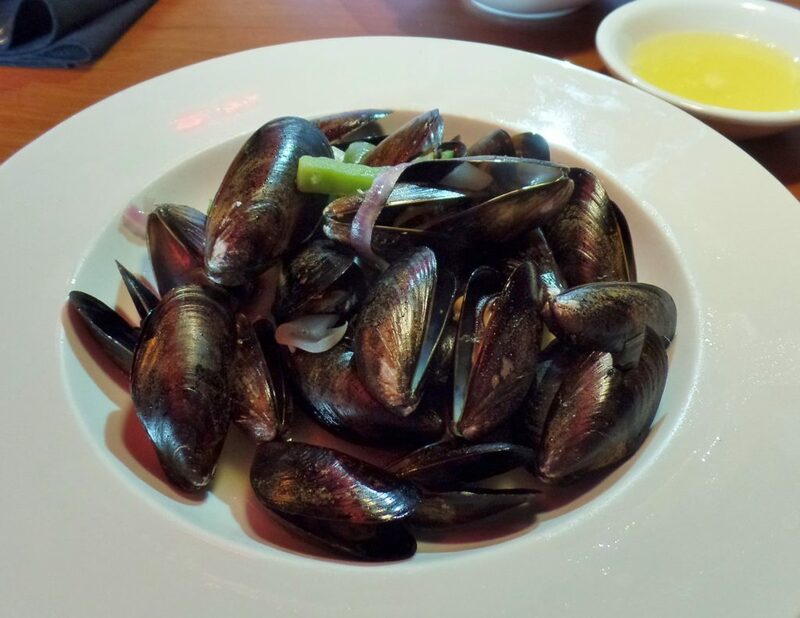 Bagel Café’s steamed mussels were the saltiest, not to mention the most diminutive I’ve ever had – although, a mussel’s size is what it is. I’m fond of food seasoned with salt but these mussels left my palate with the impression I’d been sucking on a salt lick. At first I thought it was the garlic butter dip that was salty but no. It was the mussels. Although the scallops had been described as “sautéed” they looked and tasted like scallops that had been lightly poached in white wine. Whatever the cooking method, or the heat source applied, the marine morsels were beautifully tender and succulent. I squeezed fresh lemon juice over them. It made them even brighter. I like it both ways and Bagel Café’s salad was delicious and big. 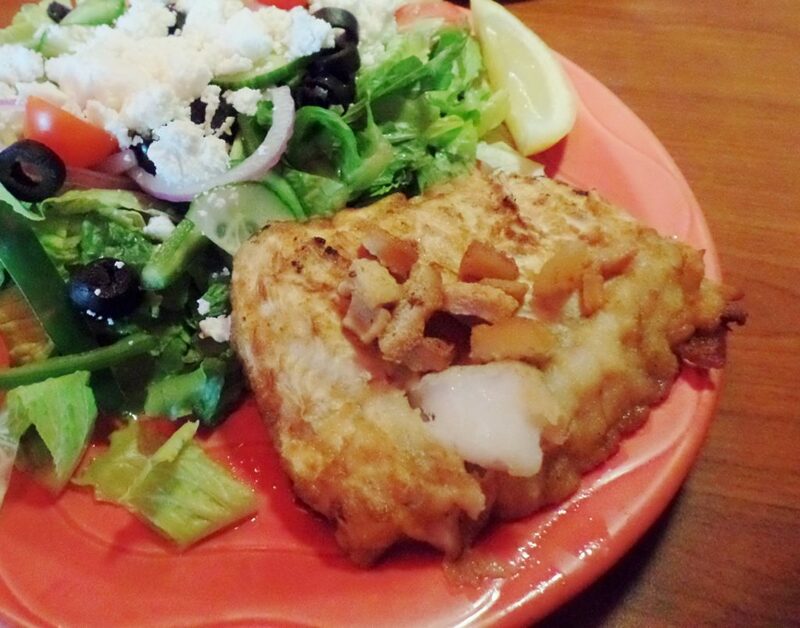 There was hardly enough room for the fish because the salad seemed to be overflowing the plate. As with many of Bagel Café’s condiments, the red wine salad dressing came in a separate disposable plastic container. At times we seemed inundated with packets, individual portion pots and sachets of one kind or another (sometimes even riding proudly, if teetering, like Hannibal on his elephant, directly on top of the food). 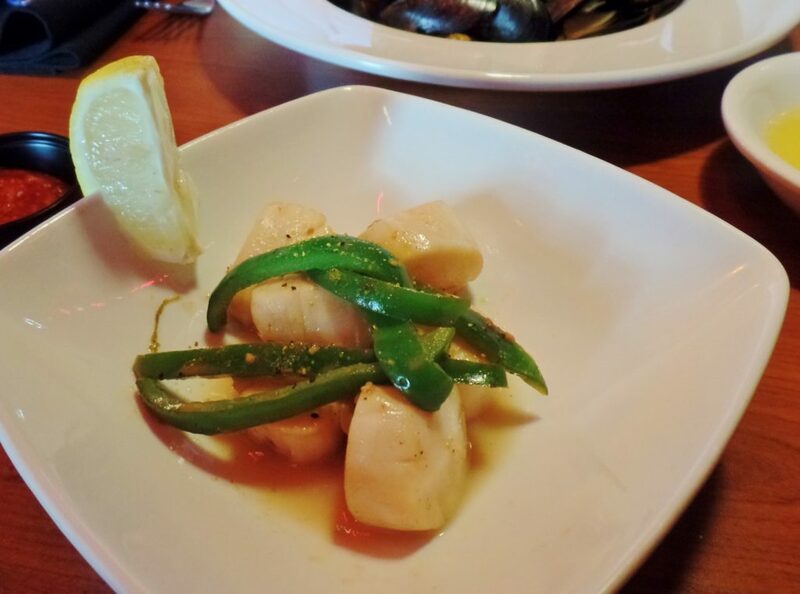 Bagel Café’s cook proved once again that he knows how to time the cooking of seafood. Tender scallops were followed by an equally tender piece of pan-fried cod with salty scrunchions. Salad and seafood made a fine pair. As I was enjoying each I felt something was missing. I remembered a fish sandwich and salad I’d had not long ago. Then I thought how terrific it would be if Bagel Café’s cod were between the two soft halves of a fresh roll and smeared with a lick of aioli. Despite having a menu with many (maybe too many) choices Bagel Café was managing to make everything (save the salty mussels) taste delectable. Presentation was a little odd with all of those teetering containers on our plates that had to be opened or ignored, but hey, it was in keeping with the unofficial troves-r-us theme of this restaurant. 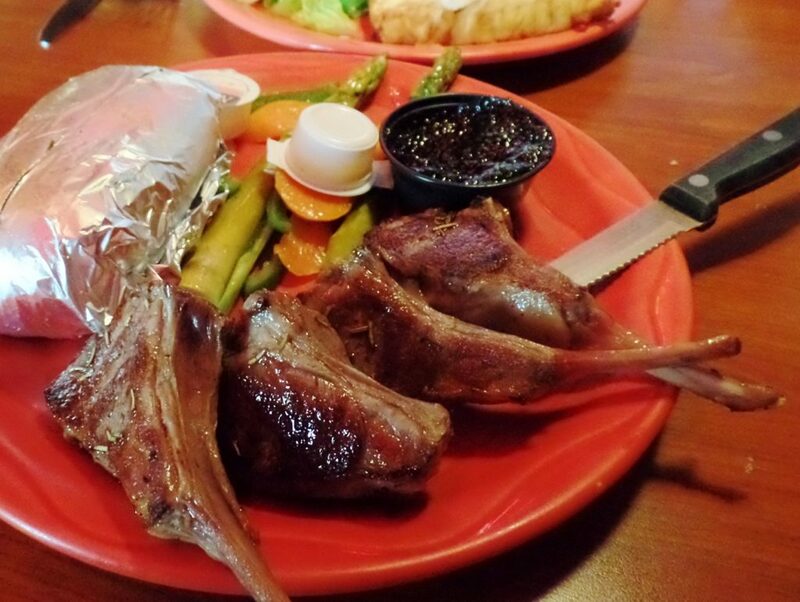 Half a rack of lamb with sautéed asparagus, a baked potato tightly wrapped in tin foil, and other vegetables had the look of something picked up at a self-serve buffet. But, again, everything was proficiently cooked and tasted good. The lamb was tender, juicy, flavourful and correctly salted. Mint sauce (in a plastic tub), a perennial British piquant lamb accompaniment, gave the meat a definite lift. Bagel Café’s desserts aren’t made in-house. Below its bouffant meringue, the lemon meringue pie, glowed fluorescent yellow, like a glow stick. 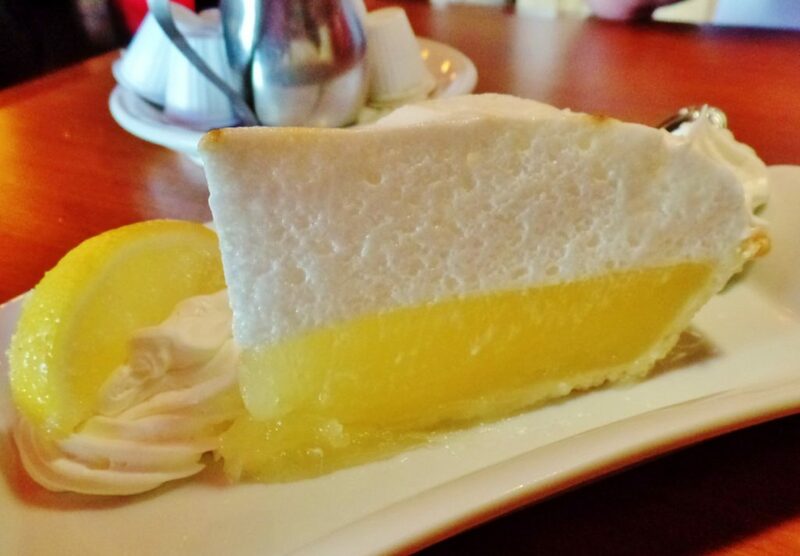 Many restaurants serve lemon pie with filling from a box but some factories do a good job of approximating the taste of real lemon. This one didn’t. It delivered a strictly ersatz version, as ersatz as the plants I was staring at. Ah well, at least the rest of Bagel Café’s food tasted genuine. Price Supper for two with appetizers, two drinks, tax and tip costs approximately $110. 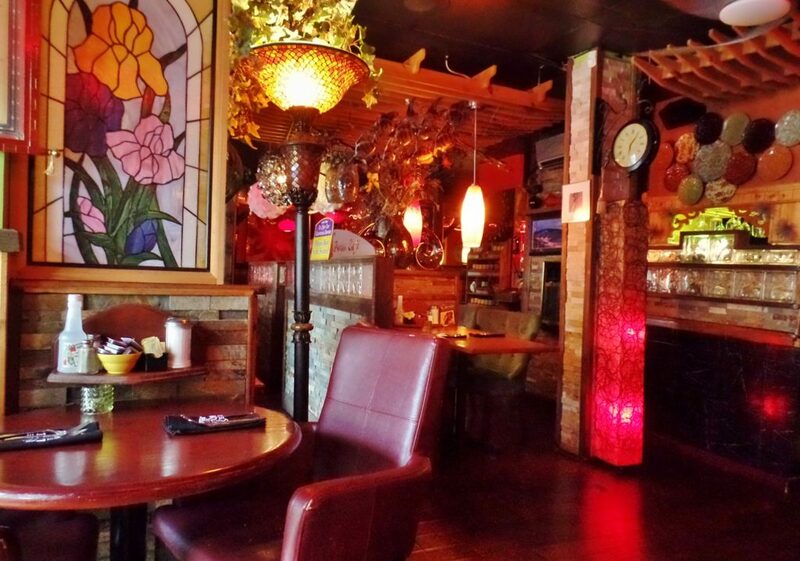 Ambiance Closed in, like a basement apartment with too many furnishings. Sound level Moderate with a scratchy music track. Beverages Bagel Café has a small selection of house wines and beer. In addition to classic Caesars, the Bagel Café offers Mimosas (Champagne and OJ) and Fuzzy Oranges (Bacardi and OJ). Cranberry juice and vodka is also available along with all the aforementioned cocktails for $5, with any meal order, before 3 p.m. Wheelchair access Bagel Café is not accessible.